LA LUCHA CONTRA EL LIBERALISMO We stand for active ideological struggle because it is the weapon for ensuring unity within El Movimiento and revolutionary organizations involved in the same interest as our fight. Liberalism rejects ideological struggle and stands for unprincipled peace, thus giving rise to a decadent attitude and bringing about political degeneration in certain units and individuals in El Moviento and the revolutionary organization. Liberalism manifest itself in various ways: 1) To let things slide for the sake of peace and friendship when a person has clearly gone wrong and refrain from principled argument because he is an old acquaintance, a fellow townsman, a schoolmate, or a loved one. To touch on the matter lightly instead of going into it thoroughly, so as to keep on good terms. The result is that both the organization and the individual are harmed. 2) To indulge in irresponsible criticism in private instead of actively putting forward one's suggestions to the organization. To say nothing to people to their faces but to gossip behind their backs, or to say nothing at a meeting but to gossip afterwards. To show no regard at all for the principles of collective life, but to follow one's own inclination. 3) To let things drift if they do not affect one personally. To say as little as possible while knowing perfectly well what is wrong. To be worldly wise and play safe and seek only to avoid blame. 4) To indulge in personal attacks, pick quarrels, vent personal spite or seek revenge instead of entering into an argument and struggling against incorrect views for the sake of unity or progress or getting the work done properly. 5) To hear incorrect views without rebutting them (and even to hear counter-revolutionary remarks without reporting them) but instead to take them calmly as if nothing had happened. 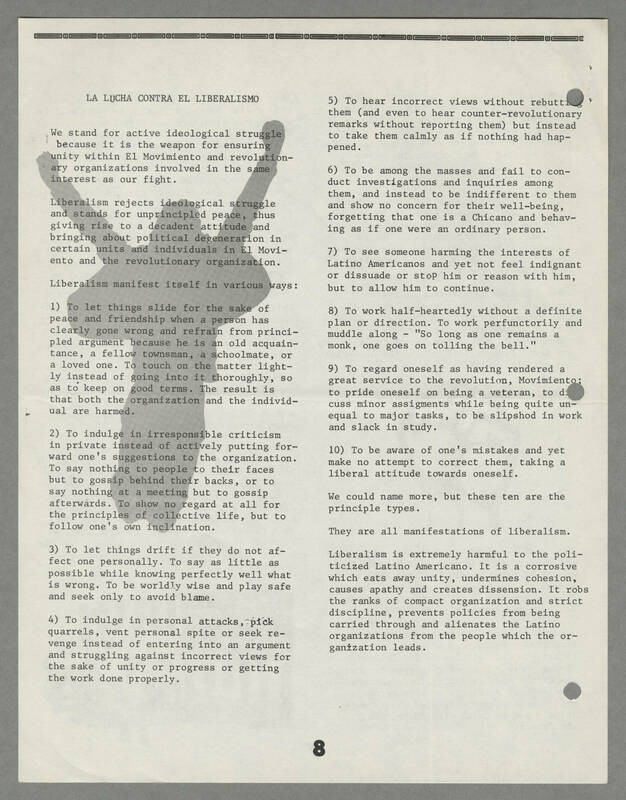 6) To be among the masses and fail to conduct investigations and inquiries among them, and instead to be indifferent to them and show no concern for their well-being, forgetting that one is a Chicano and behaving as if one were an ordinary person. 7) To see someone harming the interests of Latino Americanos and yet not feel indignant or dissuade or stop him or reason with him, but allow him to continue. 8) To work half-heartedly without a definite plan or direction. To work perfunctorily and muddle along - "So long as one remains a monk, one goes on tolling the bell." 9) To regard oneself as having rendered a great service to the revolution, Movimiento; to pride oneself on being a veteran, to discuss minor assignments while being quite unequal to major tasks, to be slipshod in work and slack in study. 10) To be aware of one's mistakes and yet make no attempt to correct them, taking a liberal attitude towards oneself. We could name more, but these ten are the principle types. They are all manifestations of liberalism. Liberalism is extremely harmful to the politicized Latino Americano. It is a corrosive which eats away unity, undermines cohesion, causes apathy and creates dissension. It robs the ranks of compact organization and strict discipline, prevents policies from being carried through and alienates the Latino organizations from the people which the organization leads.